— Life On Earth In our solar system, Earth J* is the third planet from the Sun. The amount of energy that reaches Earth from the Sun helps make the temperature just right for life. Mercury, the planet closest to the Sun, is too hot during the day and too cold at night to make life possible there. Venus, the second planet from the Sun, has a thick, carbon dioxide atmosphere and high temperatures. It is unlikely that life could survive there. Mars, the fourth planet, is much colder than Earth because it is farther from the Sun and has a thinner atmosphere. It might support microscopic life, but none has been found. The planets beyond Mars probably do not receive enough heat and light from the Sun to have the right conditions for life. On a visit to Yellowstone National Park in Wyoming, you might see a prairie scene like the one shown in Figure 2. Bison graze on prairie grass. 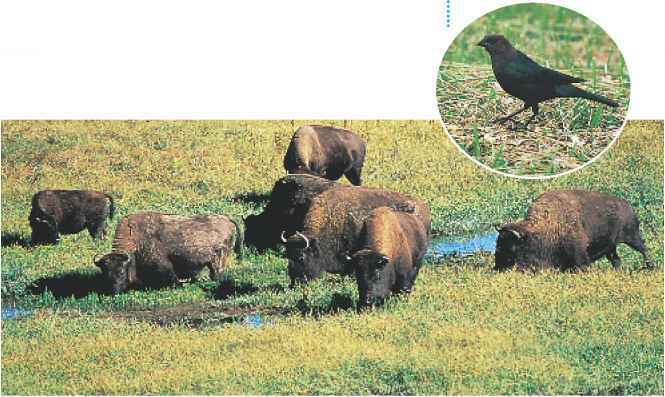 Cowbirds follow the bison, catching grasshoppers that jump away from the bisons' hooves. This scene is part of an ecosystem. An ecosystem consists of all the organisms living in an area, as well as the nonliving parts of that environment. Bison, grass, birds, and insects are living organisms of this prairie ecosystem. Water, temperature, sunlight, soil, and air are nonliving features of this prairie ecosystem. Ecology is the study of interactions that occur among organisms and their environments. Ecologists are scientists who study these interactions. [ffiEm What is an ecosystem? Figure 2 Ecosystems are made up of living organisms and the nonliving factors of their environment. In this prairie ecosystem, cowbirds eat insects and bison graze on grass. List other kinds of organisms that might live in this ecosystem. (t)John W. Bova/Photo Researchers, (b)David Young/Tom Stack & Assoc. Visit booke.msscience.com for Web links to information about the estimated human population size for the world today. Activity Create a graph that shows how the human population has changed between the year 2000 and this year. Figure 3 The living world is arranged in several levels of organization. Suppose you meet an ecologist who studies how a herd of bison moves from place to place and how the female bison in the herd care for their young. This ecologist is studying the members of a population. A population is made up of all organisms of the same species that live in an area at the same time. For example, all the bison in a prairie ecosystem are one population. All the cowbirds in this ecosystem make up a different population. The grasshoppers make up yet another population. Ecologists often study how populations interact. For example, an ecologist might try to answer questions about several prairie species. How does grazing by bison affect the growth of prairie grass? How does grazing influence the insects that live in the grass and the birds that eat those insects? This ecologist is studying a community. A community is all the populations of all species living in an ecosystem. The prairie community is made of populations of bison, grasshoppers, cowbirds, and all other species in the prairie ecosystem. An arctic community might include populations of fish, seals that eat fish, and polar bears that hunt and eat seals. Figure 3 shows how organisms, populations, communities, and ecosystems are related. Figure 4 The trees of the forest provide a habitat for woodpeckers and other birds. This salamander's habitat is the moist forest floor. Each organism in an ecosystem needs a place to live. The place in which an organism lives is called its habitat. 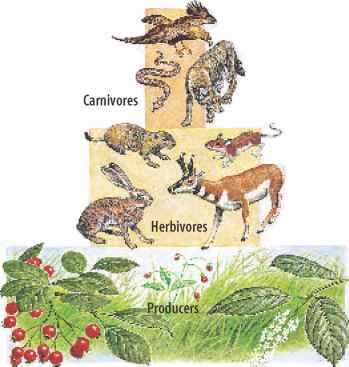 The animals shown in Figure 4 live in a forest ecosystem. Trees are the woodpecker's habitat. These birds use their strong beaks to pry insects from tree bark or break open acorns and nuts. Woodpeckers usually nest in holes in dead trees. The salamander's habitat is the forest floor, beneath fallen leaves and twigs. Salamanders avoid sunlight and seek damp, dark places. This animal eats small worms, insects, and slugs. An organism's habitat provides the kinds of food and shelter, the temperature, and the amount of moisture the organism needs to survive. • The biosphere is the portion of Earth that supports life. • An ecosystem is made up of the living organisms and nonliving parts of an area. • A population is made up of all members of a species that live in the same ecosystem. • A community consists of all the populations in an ecosystem. • A habitat is where an organism lives. 1. List three parts of the Earth included in the biosphere. 2. Define the term ecology. 3. Compare and contrast the terms habitat and biosphere. 4. Identify the major difference between a community and a population, and give one example of each. 5. Think Critically Does the amount of rain that falls in an area determine which kinds of organisms can live there? Why or why not? 6. Form a hypothesis about how a population of dandelion plants might be affected by a population of rabbits. Wild crickets feed on plant material at night. They hide under leaves or in dark damp places during the day. In some pet shops, crickets are raised in cages and fed to pet reptiles. Crickets require plenty of food, water, and hiding places. As a population of caged crickets grows, extra food and more hiding places are needed. To avoid crowding, some crickets might have to be moved to other cages. Food and Space Organisms living in the wild do not always have enough food or living space. The Gila woodpecker, shown in Figure 5, lives in the Sonoran Desert of Arizona and Mexico. This woodpecker makes its nest by drilling a hole in a saguaro (suh GWAR oh) cactus. Woodpeckers must compete with each other for nesting spots. Competition occurs when two or more organisms seek the same resource at the same time. Growth Limits Competition limits population size. If available nesting spaces are limited, some woodpeckers will not be able to raise young. Gila woodpeckers eat cactus fruit, berries, and insects. If food becomes scarce, some woodpeckers might not survive to reproduce. Competition for food, living space, or other resources can limit population growth. In nature, the most intense competition is usually among individuals of the same species, because they need the same kinds of food and shelter. Competition also takes place among different species. For example, after a Gila woodpecker has abandoned its nest, owls, flycatchers, snakes, and lizards might compete for the shelter of the empty hole. 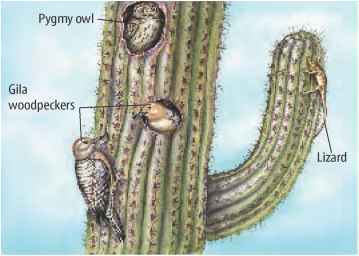 Figure 5 Gila woodpeckers make nesting holes in the saguaro cactus. Many animals compete for the shelter these holes provide. ■ Identify methods for estimating population sizes. ■ Explain how competition limits population growth. ■ List factors that influence changes in population size. Competition caused by population growth reduces the amount of food, living space, and other resources available to organisms, including humans. Ecologists often need to measure the size of a population. This information can indicate whether or not a population is healthy and growing. Population counts can help identify populations that could be in danger of disappearing. Some populations are easy to measure. If you were raising crickets, you could measure the size of your cricket population simply by counting all the crickets in the container. What if you wanted to compare the cricket populations in two different containers? You would calculate the number of crickets per square meter (m2) of your container. The number of individuals of one species per a specific area is called population density. Figure 6 shows Earth's human population density. Measuring Populations Counting crickets can be tricky. They look alike, move a lot, and hide. The same cricket could be counted more than once, and others could be completely missed. 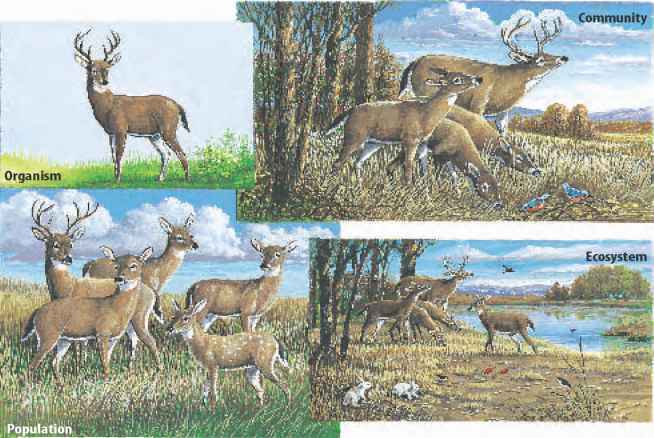 Ecologists have similar problems when measuring wildlife populations. One of the methods they use is called trap-mark-release. Suppose you want to count wild rabbits. Rabbits live underground and come out at dawn and dusk to eat. Ecologists set traps that capture rabbits without injuring them. Each captured rabbit is marked and released. Later, another sample of rabbits is captured. Some of these rabbits will have marks, but many will not. By comparing the number of marked and unmarked rabbits in the second sample, ecologists can estimate the population size. 1. Fill two plant pots with moist potting soil. 2. Plant radish seeds in one pot, following the spacing instructions on the seed packet. Label this pot Recommended Spacing. 3. Plant radish seeds in the second pot, spaced half the recommended distance apart. Label this pot Densely Populated. Wash your hands. 4. Keep the soil moist. When the seeds sprout, move them to a well-lit area. 5. Measure and record in your Science Journal the height of the seedlings every two days for two weeks. 1. Which plants grew faster? 2. Which plants looked healthiest after two weeks? 3. How did competition influence the plants? Figure 6 This map shows human population density. Interpret Illustrations Which countries have the highest population density?